For the third year in a row, we are supporting the Goal Plus – Play Football project, helping PluSport make football even more popular among disabled people. Messi, Neymar, Ronaldo. The whole world knows who they are. Football is the most popular sport on our planet and, helping PluSport will make access to sport, and football in particular, easier for everyone, regardless of any disability. In 2018, we included the Goal Plus project in a fascinating photographic exhibition showing the benefit of football in our activities with children and how it is used as a factor of social positive change. In April, PluSport representatives will have a unique opportunity to celebrate the partnership during the UEFA Youth League (the Champions League equivalent for U-19 club teams) finals in Nyon-Colovray at the end of April, when participating players from all over Europe will join in various activities with disabled athletes as part of social awareness projects. PluSport will be in attendance with a blind football team and an inflatable training pitch, showcasing blind football to players and spectators alike. On the occasion of the world autism awareness day, FIRAH and its universities and stakeholders European partners publish TIPS. This booklet in done in a question and answer format. It gathers answers of children and adolescents with ASD, to their parents, and to professionals working with these children on the use of new technologies. The questionnaires included questions on the digital tools and method of use, the different areas (educational, communication, logic…) in which they were used, appropriation, and specific questions on verbal communication and social interactions. The questionnaires were filled in by 111 professionals, 137 parents, and 90 children or adolescents with ASD, from Belgium, France, Luxembourg, United Kingdom and Switzerland. Tips was created through the autism and new technologies program led by FIRAH and the UEFA Foundation for children. On Sunday 30 April, 22 children and teenagers from Axpo PluSport football teams accompanied the players of Grasshopper Club Zürich and FC Lugano onto the pitch at Letzigrund stadium ahead of their Super League tie. Many young football fans dream of lining up on the pitch alongside their favourite players. On 30 April, that dream came true for 22 disabled children and teenagers thanks to PluSport, the umbrella organisation for disabled sports in Switzerland. The lucky player escorts were selected from the Axpo PluSport teams of FC Zürisee Juniors, FC Turbi, FC Wiggenhof and Ponte Kickers Zofingen. The initiative was made possible with the support of Grasshopper Club Zürich. And what about the children, what did they think of it all? “It was super cool,” according to Naomi König (14), whose sister, Saskia (16), said: “I thought it was a unique experience, something really special.” Others, such as Tobias Ruf, would have clearly preferred to play themselves! 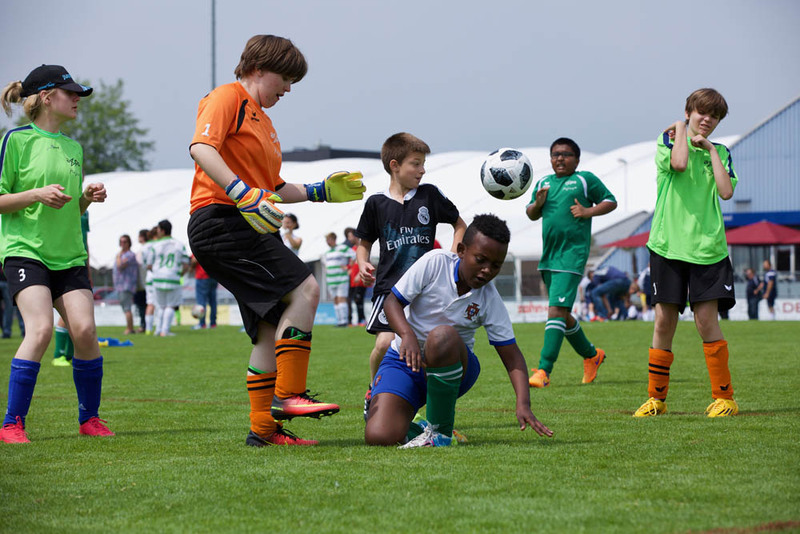 The UEFA Foundation for Children welcomes this initiative, which shows once again that football is open to all. Aside from the joy it spreads, football enables disabled children to stay active and it gives them strength to tackle the challenges they face in day-to-day life. The UEFA Foundation for Children supports applied research projects designed to improve communication and education for autistic children in Europe. In 2015, the foundation’s board of trustees decided to award its entire annual solidarity fund of €1m to the International Foundation of Applied Disability Research (FIRAH). FIRAH works in close cooperation with a number of partners, particularly universities in various European countries and national and international associations for autistic children and their families. The foundation’s financial support for FIRAH will last for four years but has already made it possible to develop a project entitled ‘çATED pour tes dents’ (çATED for your teeth). The independence of children with autism spectrum disorder (ASD), notably regarding their oral health, is a specific research domain and an important real-life issue for families and professionals. The çATED app was developed by researchers, engineers, professionals and parents of autistic children. It enables the children to be more independent and more confident and to organise themselves so they can complete their daily tasks. A visual timetable provides a representation of the day that the children can fill in themselves with their parents, organising and adapting it according to their needs and how they do things. This customisation makes it easier for the child to take charge. The app also makes it possible to break a complex task down into simpler sub-tasks, making it easier for children to learn how to brush their teeth, and helps them to integrate doing so into their daily routine after each meal. The app also makes it easier to prepare for and carry out one-off tasks that could cause anxiety, such as going to the dentist. The çATED pour tes dents project is led by the University of Nantes in cooperation with the disability organisations ADAPEI 44, Agir et Vivre l’autisme and Chrysalide de l’Être. A series of videos providing more information about the project and how people can use the app in their daily lives is available on the çATED pour les dents YouTube channel. The development of an evidence-based practice evaluation tool to support technologies linked to ASD. The development of a software program that involves training, cooperative social interaction and motor learning, with the objective of developing children’s social, interaction and cooperation skills. e-GOLIAH, a project providing digital games that help children improve their joint attention and imitation skills, two abilities that are key for their first social interactions and communication. This project involves a more natural way of taking action, as it focuses on children under five and is used at home with the involvement of the children’s parents. Thus the project to improve the lives of autistic children and their families, and to give them hope for the future. The FIRAH is working with a number of partners to run this project: representatives of international and national associations for autistic children and their families; educational, social and medical services that come into contact with autistic children every day; and universities and research centres. Facilitating access to the latest educational material and equipment such as robots and tablets, adapted to the specific needs of autistic children and their families. Training families and professionals working with autistic children so that they can help autistic children make use of new technology, with online guides and training available to families and professionals. Developing applied research projects to assess the impact new technology (robots, tablets, etc.) has on the every lives of autistic children in order to improve the equipment and apps available. All such research projects will involve the children, their parents and professionals to deliver concrete results based on the needs and expectations of autistic children and their families. The project will be implemented chiefly in six European countries in order to keep it relatively local and focused on the real needs of families. The children, their parents and professionals will be involved in evaluating the results. World Autism Awareness Day takes place on Saturday 2 April, and the UEFA Foundation for Children is lending its support as part of a long-term project aimed at helping to improve the lives of autistic children and their families and giving them hope for the future. As part of its activities on behalf of children across the world, the UEFA foundation allocated its annual support grant for 2015 to a project designed to improve communication and education for autistic children in Europe. The innovative project is being coordinated by the International Foundation of Applied Disability Research (FIRAH). The slogan for the project comes from Mahatma Ghandi: “Be the change that you wish to see in the world.” To this end, FIRAH has entered into partnerships with international and national associations for autistic children and their families, as well as educational, social and medical services. All of these partners have regular contact with autistic children to help bring happiness into their daily lives. The FIRAH project is called Autism and New Technologies, and is being implemented for a four-year period in six European countries – Belgium, France, Luxembourg, the Republic of Ireland, Switzerland and the United Kingdom. Partners include around 30 institutions using new technologies for autistic children aged between 2 and 18, in addition to university partners and associations in the six countries. Developing applied research projects to assess the impact of new technology (robots, tablets, etc.) on the everyday lives of autistic children in order to improve the equipment and apps available. All such research projects will involve the children, their parents and professionals to deliver concrete results based on the needs and expectations of autistic children and their families. The children, their parents and professionals will be involved in evaluating the results of the Autism and New Technologies project. “The UEFA Foundation for Children is delighted to give its backing to this project of considerable importance,” said the chairman of the foundation’s board of trustees, former European Commission president José Manuel Barroso. “Autism represents a great challenge for modern society, and I have no doubt that the deployment of new technologies in this area will bring significant results not only for FIRAH and its partners in their pioneering work, but also for autistic children and their families. The UEFA Foundation for Children has decided to allocate its €1m annual solidarity fund for 2015 to a project designed to improve communication and education for autistic children in Europe. The project is organised by the International Foundation of Applied Disability Research (FIRAH). Inspired by its innovative approach, which combines technology and new teaching methods, the board of trustees decided to give the project the foundation’s backing so that a greater number of children with autism can benefit from the tools available. The foundation will also support research and development with a view to better meeting the needs of autistic children and their families.